Almost everyone has gone to the WebMD website when they were feeling under the weather to see what they might be sick with. There’s always the usual culprits: the common cold, sinus infection, or dehydration. However, there’s also always some kind of outlandish illness such as mad cow, a blood disease no one has ever heard of, or tuberculosis. I actually just put in that I have a cough and it said there’s a slight chance I might have West Nile Virus. SOS. This is an obvious one. I got tested for mono three separate times my Junior year alone. Never had it. I don’t even kiss anyone so I don’t know why I’m thinking I might ever have it, BUT YOU NEVER KNOW!!! I’m also super drawn to the idea of getting to sleep all the time or just sit in bed for fear of spleen explosion because then I’d have time to catch up on my television shows. I have no idea what has happened in the past couple weeks of Revenge and it is killing me. People might even feel bad for me and bring me delicious treats like ice cream or bagels or crunchwrap supremes! It’s a valid and likely (if you’re kissing people) illness to have during my college years and I’m tired all the time anyway so maybe it’s mono! I may have just gone out to the bars the past five nights, but no, it’s definitely mono. I might only get 4 hours of sleep a night and that might be why I feel horrible, but instead it could be mono! Test my blood, for this time it might actually be it. The health center thinks I’m an idiot anyway because I go there too much and they hung out with me while I was on pain medication after my ACL surgery, but one day I will actually have mono and we will see who has the last laugh. This baby doesn’t even have the ability to use an inhaler. 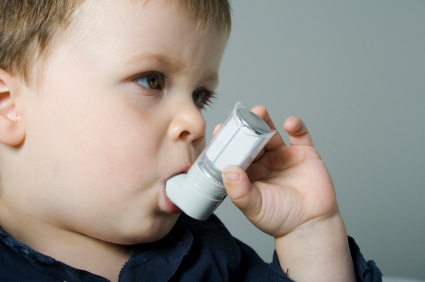 I chose this picture because the baby clearly isn’t using the inhaler correctly. What a dumb baby! Someone should teach him! I, like many other people, tend to find it hard to breathe while running on the treadmill. It might be the fact that I’m executing a demanding exercise, it might be that I haven’t ran on the treadmill in two months, OR I could have asthma!!!! The kind that only comes around when I’m exercising. And only when I’m running on a treadmill and not when I’m running outside or playing ultimate frisbee. I’ve never been tested, but I figure I don’t have to because I rarely run on the treadmill anyway, but that definitely doesn’t mean that I don’t have a very specific kind of asthma. This one time my brother tickled me and I laughed really hard and coughed because I choked on my own spit and found it hard to breathe so maybe it’s asthma. There’s a lot of proof, I swear. This poor man was not only hit by four different lightning strikes at once, but he was also hit with lactose intolerance. Look at how sad he is! A correct portrayal would involve him on the toilet instead of a chair that isn’t a recliner. I don’t know why any chairs exist that aren’t recliners. Every single chair ever should have a reclined option. Continuing onward: Lactose intolerance is one of those things that I think everyone has thought they’ve had once or twice or even thrice. Some people actually have it and can never truly enjoy the gift of ice cream cake, which is a real shame. Sometimes I eat way too much ice cream and then my tummy hurts and then I have lactose intolerance. Sometimes I eat ice cream and my tummy doesn’t hurt and then I don’t have lactose intolerance. It says online that it’s something that you have consistently, but my mom and high school teachers are always telling me to not always believe everything I read on “The Web” so this is one of those. Will someone buy me ice cream now? I really want some. I hope you’ve all enjoyed my ramblings once again. Check back and read some of my older ones, I hear the wipe out application is decent, although apparently the people at Wipe Out don’t seem to think so. Feel free to send them strongly worded letters in support of my participation. I pinkie promise I’ll try to write more, but we all know that a month from now I’ll be apologizing again. SORRY.